Is al-Ibanah Attributed to Imam al-Ash’ari Authentic? The Ash’aris of today are, therefore, according to their logic not upon the path that Imam Abu al-Hasan tread in his final stage and they, therefore, falsely ascribe themselves to him. The Wahhabi argument which they think stands as a proof against the Ash’aris is thus rendered completely pointless. And, yes, indeed truth is not weighed by men which is why the Ash’aris have never ascribed themselves to Imam al-Ash’ari due to their blind following (taqlid) of his positions in divine Unity (tawhid). Neverthless, a closer examination of their claims reveal how flimsy their pointless arguments really are. Unlike his widely documented repentance from Mu’tazalism, we find the alleged second ‘repentance’ of Imam Abu al-Hasan al-Ash’ari unsupported by reports from the earlier historians or from his own companions and students. Rather, apart from the likes of Shaykh Ibn Taymiyya (d.728h) and those who followed him in this regard, we find their mentioning only two phases in the Imam’s life – his leaving the Mu’tazila and then entering upon the methodology of the salaf and Ahl al-Sunna. The idea that Al-Ibanah ‘An Usul al-Diyanah was written contrary to the methodology of Ibn Kullab in a separate third phase also opposes what we hear from the likes of Imam Ibn Hajar who said in Lisan al-Mizan (3;291): “In his book al-Ibanah, al-Ash’ari was upon his [Ibn Kullab’s] path.”. “McDonald W. as well as the Salafiya believes the two styles to be clearly different. Despite that, they believe that the phase of Al-Ibanah is the final phase of which the opinion of Al-Ash’ari settled upon – and Goldziher also agrees with that – even though McDonald and the Salafiya differ with regard to the justification for his change from the rational style that Al-Luma’ portrays to the Salafiya style that Al- Ibanah portrays. McDonald believes that he was compelled to abandon the rational style and to establish the face, the hands, and others after he settled in Baghdad during the last days of his life and his fall under the influence of the Hanbalis. What that means is that he invented the second style to earn the satisfaction of the Hanbalis. And perhaps to ward off their evil too. So the matter isn’t one of Aqida. Rather, it is a matter of conforming to circumstances and observing what they require. And perhaps what bears witness to that is the statement of some of them that: “The Ash’aris attributed Al-Ibanah to the Hanbalis as a shield.” However, this explanation doesn’t please the Salafiya chiefs. Rather, they say: “Al-Ash’ari arrived to the truth in phases. First, he abandoned the madhhab of the Mu’tazilah to his rational madhhab. So he attained half of the truth. Then he finally left his rational madhhab to the madhhab of the Salaf. So he attained the truth fully, and then he died well-pleased with.” And this is a view that appears to be acceptable. But it will remain a hypothesis until it finds the decisive evidence that supports it. On the other hand, I believe that there is another hypothesis that is more worthy of claiming and closer to acceptance. 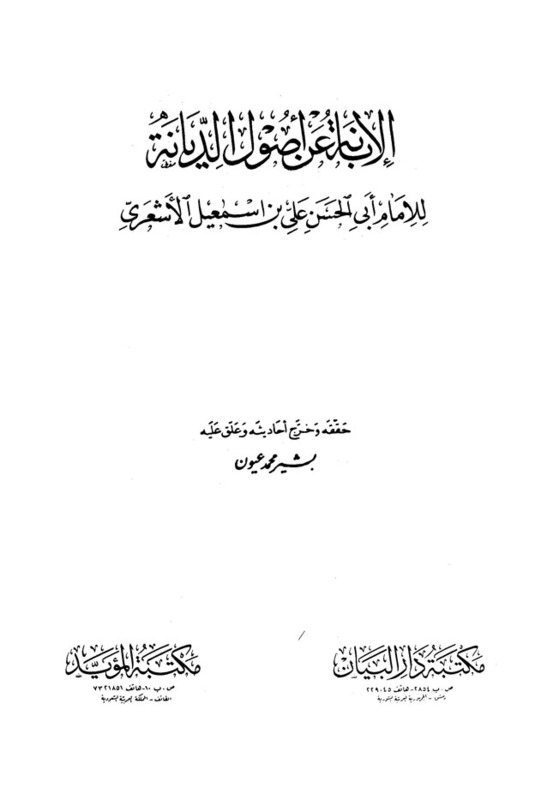 It is that the Salafiya style that Al-Ibanah portrays issued first, and that the rational style that Al-Luma’ portrays issued last and that it set the boundaries for the madhhab of Al-Ash’ari in its final form upon which its proponent died while adopting it believing its correctness, defending it, and being pleased with it for his followers. 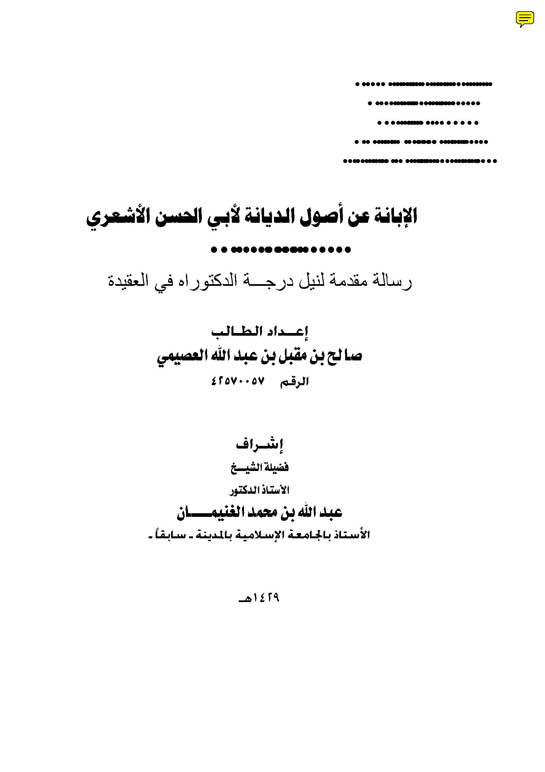 Kitab al-Ibanah doesn’t contain one rebuttal of Al-Ash’ari’s supposed previously held rational doctrine as claimed by the So-Called Salafis and Hanbalis. So if Al-Ash’ari had taken back any thing he believed, why is it that we don’t find him repudiating any of his prior beliefs? “Or if it were his last work it would still leave room to believe that he still acknowledged his rational doctrine to be the truth as maintained by McDonald W.
Regardless of when in his sunni phase it was written, today’s al-Ibanah is certainly not the same text authored by Imam al-Ash’ari, the unaltered version of which was known to and praised by Ibn `Asakir, Abu ‘Uthman al-Sabuni , Imam al-Bayhaqi and the other Ash’ari Imams in the past. 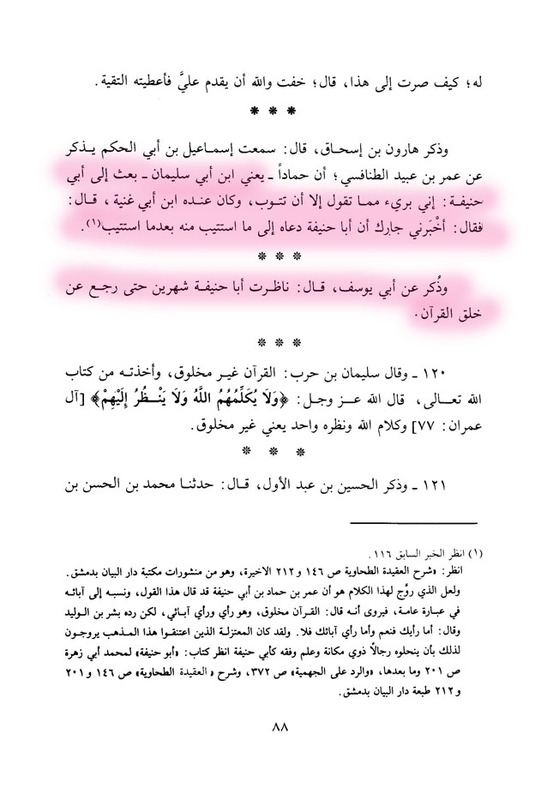 – The takfir of Imam Abu Hanifa by Imam Hammad – despite the dispute relating to the creation of the Qur’an arising after the death of Imam Hammad. – The claim that Imam Abu Hanifa would say that the Qur’an is created. – Discrepancies in the different copies of the text of al-Ibanah available today including differences with the printed edition edited by Dr. Fawqiyya Husayn Mahmud who used four manuscripts for her own version which despite this remains flawed. – Differences between the passages that Imam Ibn Asakir quoted and present versions of al-Ibanah. 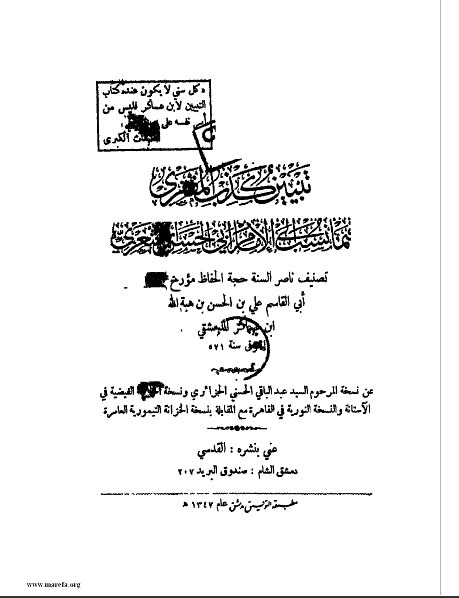 That Kitab al-Ibanah in its current available format is unreliable was also the opinion of Imam al-Kawthari who severely criticised the edition printed in India and called for a reprint of al-Ibanah based on reliable sources. 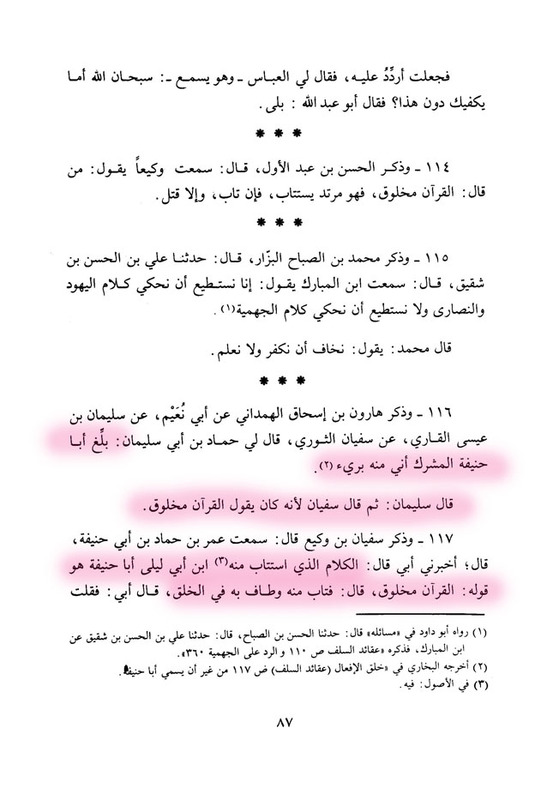 So that the Wahhabis do not accuse us of spreading lies, please see below scanned passages from the books in print relating to some of the above mentioned points. Translation: And that He has two eyes (`Aynayn) without modality. Translation: And that He has an eye (`Ayn in singular form) without modality. 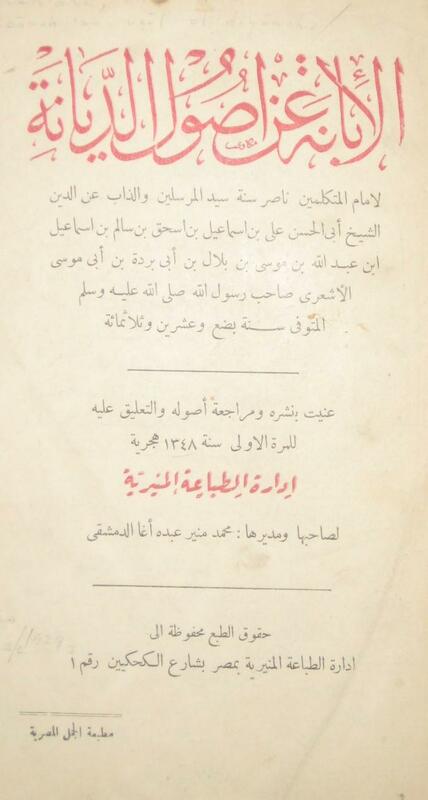 Below is the cover of an edition of Kitab al-Ibanah printed in Saudi Arabia. The question arises as to why this quote is absent from other manuscripts which the other editions in print have used? 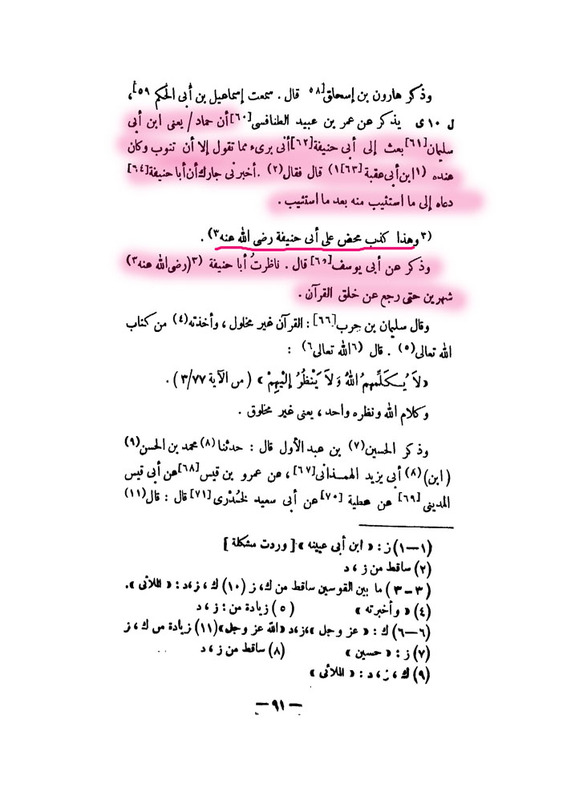 If you say ‘this phrase was added later’ then you confirm the tampering in the text of the book such that one can not be sure that everything found therein is actually from Imam al-Ash’ari! Again, this statement of Imam al-Ash’ari is not found in the other printed versions. Many scholars of the Hanafi school of law followed the methodology of Imam al-Ash’ari in theology. If Imam al-Ash’ari had truly attributed this belief to Imam Abu Hanifa why would the Hanafis hold him in such high esteem? Rather this is just one more example amongst many which confirm to us that these chainless versions of Kitab al-Ibanah originally written early in the Imam’s Sunni career which we currently have in our possession are unreliable and far from being authentically preserved. But how sad that the Wahhabi Najdis are like this. Their proofs and arguments are weaker than dust on a windy night. And to Allah is our complaint. See Majmu’a al-Fatawa: 4/71 and 5/556. Translation by ‘Abu Iyaad’ who runs a Hashwi website attacking the Ash’aris. 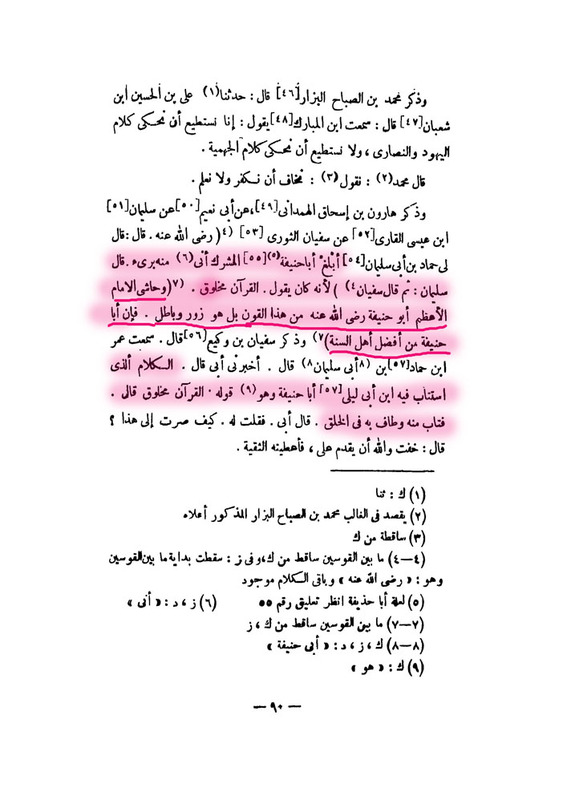 Incidentally, in what is an example of textual discrepancy in the available copies of Kitab al-Ibana we find that in other editions of the book the ending statement is not found and it only says: “Indeed Allah is established above His Throne, as He has said: The Most Merciful rose over the Throne…”. “He has no form that can be expressed and He has no limit by which one might strike a similtude for Him”. Such statements are just another thorn in the side of those Wahhabis who do attribute a form and limit to Allah, Most High. One would have to question why the Hanbali literalist al-Barbahari was reported to have rejected the untampered Kitab al-Ibanah written, according to Hafiz Ibn Hajar, upon the path of Ibn Kullab while his admirers today quote it without reservation. This adds to the evidence that the original version authored by Imam al-Ash’ari has not reached us today. And Allah knows best. As quoted by Shaykh Abdullah b. Hamid ‘Ali in ‘The Attributes of God’ (p. 120-121). See also p.48 of Klein, W. C.’s: Elucidation of Islam’s Foundation (New Haven, 1940). A translation of al Ash‘ari’s al Ibana ‘an usul al Diyanah. See also p.50 of Klein, W. C.’s: Elucidation of Islam’s Foundation (New Haven, 1940). A translation of al Ash‘ari’s al Ibana ‘an usul al Diyanah. Further on (in a section not quoted by Ibn `Asakir) we find in the Wahhabi, Munir Abduh Agha’s 1929 Cairo edition a title heading ‘Chapter Containing the Kalam Concerning God’s Face, His Two Eyes, His Sight and His Two Hands’ only to be followed in the text of the chapter by the statement “Allah Almighty and Exalted has said that He possesses a face and an eye which is neither given modality nor defined”! Imam al-Bayhaqi in al-I’tiqad with a chain of reliable narrators reports from Muhammad bin Said bin Sabiq that he said: I asked Abu Yusuf: Did Abu Hanifa used to say that the Qur’an is created? He replied: No! Allah’s refuge is sought, and neither do I say it! …..
Have you guys read this response to your article? as-salamu `alaikum ‘Maroof’. Many thanks for the links. They were useful in highlighting the nature of the Wahhabis who cannot help from resorting to their usual insults and gutter talk. The author in his selective quotation of our article did make us realise a small inadvertent mistake in our article which has consequently been amended and altered. Please note also that as has been stated on various forums the work above is a draft beta version and will be added to and amended later insha’Allah. Nevertheless we leave it to the readers to compare what has been written and come to their own conclusions. Ahl al-Sunna affirm all that has been mentioned in the Noble Qur’an. The word ‘Ayn is only in the singular and plural form in the Qur’an but never in dual form. We deny that the word in this context refers to a body part and we consign the precise meaning of the word in relation to Allah without researching into it further. This consignment is certainly the way of the Salaf which Imam al-Ash’ari’s book represents. Furthermore, in order to infer ‘two eyes’ from the plural form ‘eyes’ which has been mentioned in the divine texts one may have inadvertently drawn a comparison between Allah and His creation based on the senses. And perhaps for this reason, some non-Ash’ari scholars have rather harshly criticized those who affirm two eyes because there is no evidence for it, neither in the Qur’an nor the Sunna. The Ulama maintain that the chief aim of this saying is to assert that God cannot be described in any way that might imply imperfection, for being one-eyed is obviously an indication of imperfection. The Prophet (sallallahu alaihi wa sallam) did not mean to ascribe to God bodily organs, for there is nothing praiseworthy in the attribution of such to God. Ibn Aqil said: “The ill informed sometimes assume that since (the Prophet) denied that God is one eyed He meant to establish by a kind of inferential reason (dalil al-khitab) that God has two eyes. This is a serious misunderstanding (of the saying), for by denying that God is one-eyed (the Prophet) merely intended to negate (the possibility of) imperfection in Him…. So, the Imam (as is the practice of those Ash’ari Imams of Ahl al-Sunna who did consider Yad, Wajh and al-Ayn to be from Allah’s attributes) immediately negated any resemblance to creation – specifically negating the attribution of an organ or body part to Allah Most High. This is, of course, in keeping with the position of Ahl al-Sunna and indeed this very negation of organs and parts does not sit well with the Wahhabis as it is something which is against their own doctrine. Consequently, even if it is established that some Imams like al-Baqillani have attributed ‘Aynayn to Allah (and even if they negated Allah having organs or parts unlike the anthropomorphists) then based upon al-Baqillani’s own cited methodology we respectfully disagree and stick to what has been mentioned in the Qur’an and Sunnah. And indeed we find the early major Ash’aris like Imam al-Bayhaqi (d. 458H) who is known to have possessed Kitab al-Ibanah, Imam al-Sabuni (d. 449H) and others attributing al-ayn only in the singular form to Allah Most High in keeping with the divine texts. Nor are we aware of any of the major later authorities from the Ash’aris attributing ‘aynayn in dual form to Allah. And Allah, Glorified be He, knows best. There is no evidence that Imam al-Ash’ari said this. This statement is worded by a copyist or possessor of the manuscript. You should know this since the title ‘Imam al-A’zam’ was unknown in al-Ash’ari’s days. Servant of Allaah, thank you for confirming further evidence of tampering in the text of kitab al-Ibanah. – The Attributes are divinely ordained (tawqîfiyya) and al-Ash`ari considers it impermissible to make up or derive new terms such as mustawin and sâkin al-`arsh if there is no verse or authentic hadith transmitting them verbatim: “My method in the acceptance of the Names of Allah is Law-based authorization without regard to lexical analogy.”23 – The argument of supplication on the basis of location leads to placing Allah Almighty and Exalted inside the Ka`ba according to the same logic, an absurd impossibility. – The claim that “the Muslims all say: `O Dweller of the Throne'” is unheard of. Yet Ibn Taymiyya cites it and attempts to justify it with the narration: “Allah created seven heavens then chose the uppermost and dwelt in it,”24 adducing a condemned report to support an invented phrase! – Three editions of the Ibana have, “O Dweller of the heaven (yâ sâkin al-`samâ’)”25 which further casts doubt on the integrity of the text in addition to being equally anthropomorphist. They are trying hard and have posted 11 parts of the refutation. So where is it going to stop? Do we have a final say here? Reblogged this on insearchofilmandhaqq's Blog. Assalamu alykum, This is very good information about Al ibanah tampering, i used to be in the salafi crew, but guess what whenever i was to preach there dawah something stopped me wallah. Over 8yrs but when i checked Aqeedah in depth and turned to Allah first sincerely i would not have understood the truth from falsehood. Look at darrusalam ibn kathir tafsir lies abridged arabic english on ibn kathir on the apparent meaning vs original tafsir ibn kathir and many of his words removed. Still they pull him ibn kathir rh to there side, lies, misqouting manyy manyy scholars and the salaf words tampering! How worse can anyone get?? wallah i have there books both arabic and english when i compared the originals i was shocked!!! Lies lies! Got me Angry, real angry!! Ibn hajar qurtubi the 4 imams and there ulema.. and when we see there reply, they play around with words!! Also rejecting! Are we supposed to take the understanding of the salafis or the salaf?? That ibn uthaymeen mujassim said god is seated on the throne just like in the bible psalms 47:8!! Is he the salaf? He is nothing!! And yes i have his books totally useless now! And who are those that went astray and against these ulema? Like mr bin baz against ibn hajar asqalani rh a hadith master!!! In shafi’i madhab! In Aqeedah, and that ibn abi izz against imam tahawi rh? Salafis vs ibn kathir tafsir? Imam bayhaqi nawawi fakhruddin razi rh and loads of em. Wallah they are liars misqouting texts and still trying to fool people, the most unintelligent people i have come across as a sect is the salafis. Really you lot have no idea how i feel,.imagine muslims you trust in following the salaf and in reality you find out they been lying! Lying about scholars lying about the salaf. Trying to put u in bid’ah and kufr!! Allah saved me Alhamdulillah so much thanks to Allah swt. You know these salafis no one can help them to understand only when Allah wills he will show them the haqq! They have to turn to Allah to show them sincerely otherwise there narrow minds will never click.. there stubborness will stay no matter what u throw at em because there shayookh have injected in there blood not to listen to the other sects because they will misquide you.. From my experience was a salafi myself trust me ive seen it. And mentioning the truth like on this website in a very very rewarding thing to do Allah bless you all ameen. Dont get fooled by there slogan salafiyyah its all but words in reality there are nowhere near the salaf. They pass through texts like the khwarij. There are over 7 dif sects in them now! this fitnah of theres is an attempt to destroy our belief into kufr. In a very tricky way! May Allah support the believers and he will protect this deen as he always did so we should be in it defending it, speaking, writing books, and destroying the jaws of the innovators in every mean possible in shariah who are poisoning the muslim laymen and families into there anthropomorphic creed. The blind followers are not hanafis shafi’i maliki or hanbali(not the pseudo salafi so called hanbali) the worst blind followers today are the salafis!! The 4 madhahib are upon haqq and nothing wrong to be a hanafi! Strictly Shafi’i, maliki or hanbali, the problem is if one doesn’t understand a madhab or what following a madhab means then the defect is in him not the madhab bcoz the madhab has over hundreds of scholars with chains back to the salaf, and just a few useless men whose ancenstors were belted out of the madhahib buried in the ground by Ahlas sunnah wal jammah come and lie about the religion of Allah are just inviting for hellfire. Is there is analysis in English on Imam Ibn Furak’s work “Mujarrad Maqālāt al-Shaykh Abī al-Ḥasan al-Ashʿarī” ?